These solutions are formulated to a very specific nutrient profile for orchids. The GROW formulation should be used while orchids are producing shoots and leaves and until flower spikes begin to form. The BLOOM formulation can be used throughout the flowering period, to support spectacular florescence. Blended from the purest and most soluble mineral salts and enriched with complex organic plant acids. 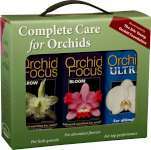 The ideal feeding programme for orchids - used by professionals and enthusiasts alike. Used and recommended by The Eric Young Foundation and many leading UK nurseries.